David Goff’s spirits are high after he survived a frightening bout with the flu. 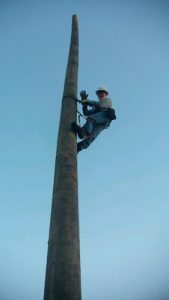 For most of his career as a lineman with Duke Energy, David Goff has climbed tall utility poles to inspect and repair high-voltage wires. It is a tough job that requires constant attention to safety and detail. Although the hours are long and the work often dangerous, Goff loves his job. But an uncontrollable cough that quickly deteriorated into a serious case of the flu threatened to render Goff unable to work again. Diagnosed with the H1N1 flu strain, or swine flu, Goff quickly fell into respiratory distress. Complications from the disease, known to affect the lungs, soon put Goff’s life in danger. A specialized technology called extracorporeal membrane oxygenation, or ECMO, at UF Health Shands Hospital would give Goff one of his best possible at survival. The device is a mechanical circulatory system that temporarily takes over the function of the lungs in patients with acute respiratory failure. It can also provide cardiac support until the patient recovers or is able to receive further treatment. Goff’s illness started with a nagging cough in December 2015. A quick visit to the doctor yielded a pneumonia diagnosis and round of antibiotics. The Goffs expected David to rebound quickly, like he always did. But a week later, Goff was coughing up blood. Alarmed, his wife, Lynn, rushed him to a hospital in Dothan, Alabama, from their home in Sneads, Florida. A nose swab for the flu came back negative, and the pneumonia diagnosis held. Goff was hospitalized, and his health quickly declined. A bronchoscopy led to the diagnosis of the H1N1 flu strain, and he fell into acute respiratory distress. His body began to swell with fluid. Goff was intubated and placed in an induced coma. Reducing the fluid load and keeping him hydrated became a delicate balance. 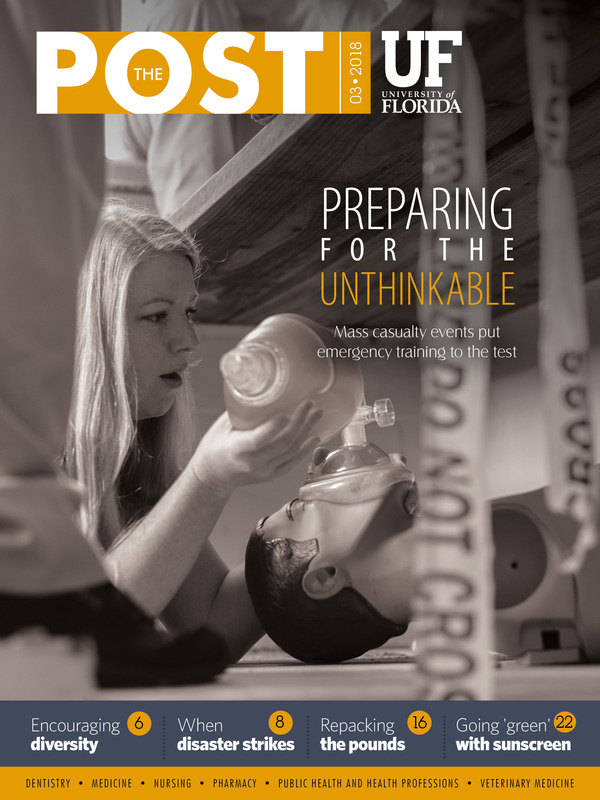 “At that point, his attending physician at the Alabama hospital called us to transfer him to UF Health Shands Hospital to manage severe acute respiratory distress — and possibly place him on ECMO,” said Hassan Alnuaimat, M.D., an associate professor in the UF College of Medicine’s division of pulmonary, critical care and sleep medicine. For four days, doctors carefully monitored Goff’s condition. They hoped that medication would reduce the fluid load on his lungs, allowing him to recover on his own. But his condition continued to decline. Goff was taken to the O.R., where a surgery team led by Tiago Machuca, M.D., Ph.D., connected him to an ECMO machine. He remained on the device for 10 days, his life hanging in the balance. For a patient like Goff, the machine is connected to one or more veins, usually near the heart. Also known as venovenous ECMO, the procedure is used to treat patients with lung complications, including acute respiratory distress syndrome. “When Mr. Goff came to us, he was quite sick. We knew we had to act quickly,” said Machuca, an assistant professor of surgery in the UF College of Medicine’s division of thoracic and cardiovascular surgery. Goff remained sedated in the intensive care unit. “It was touch and go for about a week,” Goff said. From that moment, Goff began to improve. His throat raw from a tracheotomy tube still in place, he communicated with staff by writing things down. He tracked the days by the dates on a white board in his hospital room. “That’s how I knew I had lived another day,” he said. After spending nearly three and a half weeks at UF Health Shands Hospital, Goff was stable enough to be transferred back to the hospital in Dothan. From there, he was discharged to a nearby rehabilitation facility. Toward the end of February 2016, and nearly two months from the initial pneumonia diagnosis, Goff was finally home. He crept through recovery during the first few months. For the Goffs, 2017 was a much better year. He is grateful to return to a fully active lifestyle at home and at work. He grilled 125 T-bone steaks and made baked potatoes for the annual football banquet at the local high school. “And I had the best turkey (hunting) season I’ve had in a long time,” he said.